Exquisite backyard landscape in Calgary. 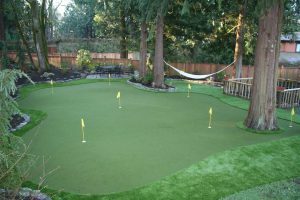 Artificial Grass putting green - Curb Design Inc. Exquisite backyard landscape in Calgary. a complete artificial grass or synthetic lawn putting green with golf holes and golf flags.